Those Coca Cola commercials that appear around Christmas where polar bears are playing with penguins have always pissed me off. A few years ago, a colleague of mine drew a cartoon that had both polar bears and penguins in it, without any reference to that being part of the joke. Ugh. I also saw a cartoon today of Kim Jong Un’s shadow being cast over the United States…and it was coming from Europe. I know I can be a real stick in the mud over such things that may seem trivial to others. But, I think it’s kinda important to know a few details, whether you’re writing commercials, drawing editorial cartoons, or heading up the Environmental Protection Agency. A report put together by several government agencies warning about climate change was leaked to the press this week. Why would something like that have to be leaked? Because, some people in those agencies are worried the Trump administration will suppress the report…or worse yet, deliver it to him underneath the stack of pro-Trump propaganda binders he receives twice a day. Creative Notes: Short blog for this as it’s a bonus cartoon. I’ll be drawing again later tonight or super early in the morning. I really liked this idea and I wanted to do it. Parts of the South are currently suffering from record droughts and wildfires are burning in every southeastern state. Wildfires in Gatlinburg and surrounding communities in eastern Tennessee has damaged hundreds of buildings and forced thousands to evacuate their homes overnight. More than 14,000 people have evacuated Gatlinburg alone. A big cause for all of this is Climate Change. Drier summers lead to more fires. Ignoring and denying Climate Change doesn’t work as the world literally will burn around you. 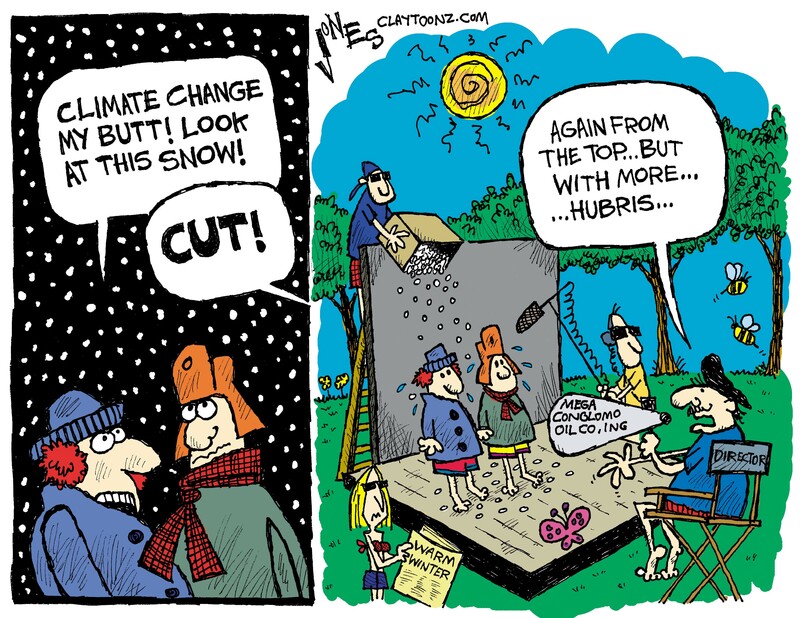 Conservatives love to point at snowfall and cold winters as proof Climate Change isn’t real and it’s all a big hoax. Republican senator Jim Inhofe is actually the ranking member of the Senate committee for the environment. This knucklehead once threw a snowball on the senate floor to prove Climate Change doesn’t exist. 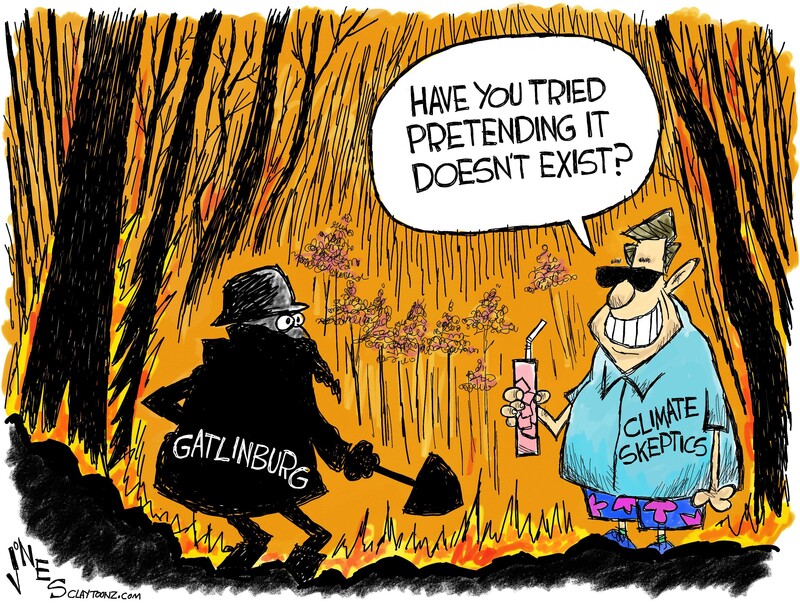 I challenge Senator Inhofe to take a snowball to Gatlinburg this week and give it a toss there. Our planet has gone through ages of discovering and enlightenment. I’m concerned that we’re entering one in this nation that’s an age of denial and stupidity. Stupidity has lobbyists. 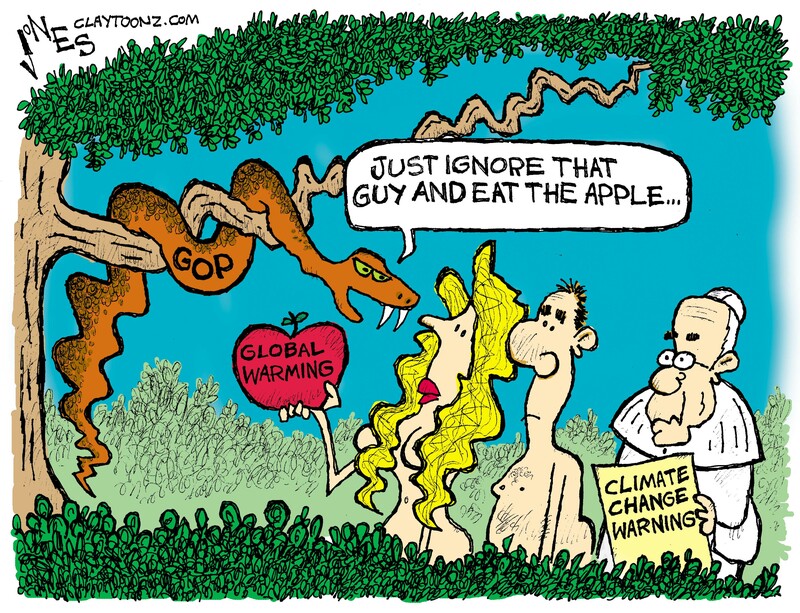 Ever since Obama said Climate Change is a greater threat than ISIS, conservatives have been giving him a lot of grief. The thing is, he’s right. Stating the threat of Climate Change doesn’t discount the real danger ISIS poses. The dangers of Climate Change will last centuries. It can devastate cities and populations. I know we don’t like to think long term, especially at the cost of profit, but this is something that can’t be ignored. The problem is we have to think intelligently and as a culture, we’re not really that smart. Half of us can’t grasp the difference between climate and weather. 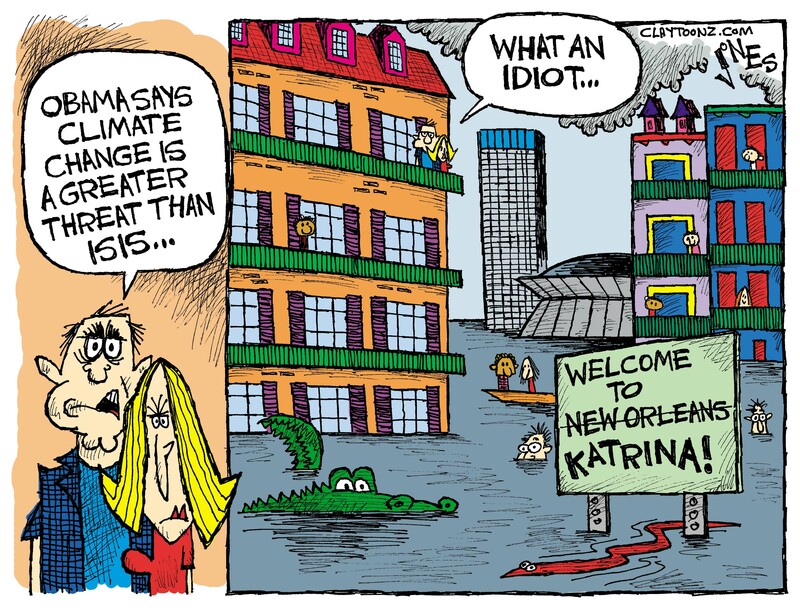 Climate Change is also a lot more difficult to combat than terrorism. You can’t drop bombs on it or put a reward on its head. This doesn’t mean we should ignore terrorism. Terrorism is another problem we have to deal with, but groups of Jihadists are not going to last as long as our climate. ISIS doesn’t even pose the most risks to us in the form of terrorism. You’re more likely to die from someone born in the United States who is not a Muslim and doesn’t give a crap about Palestine or Allah. But yet, half of us only want to focus on Islam. It’s easier to hate bad guys who don’t look like us. They’re also organized and even have a flag. That gives us a target. Domestic terrorists are not as organized. They tend to work alone and if they wave a flag, it’s the Gadsden or Confederate flag which just confuses everybody. We need to focus on what’s more dangerous. That includes the climate. It also includes domestic terrorists and our proliferation of guns. Let’s put politics aside and forget the color, religion, and race of the terrorists. Let’s talk about it. Let’s propose solutions. Half of us won’t even acknowledge there is a crisis and fight any effort to make it more difficult for bad guys to buy guns. I agree with conservatives that the president’s comments that ISIS was a JV team was pretty stupid and a sign he underestimated them. But he’s right about Climate Change. You can continue to mock him for it, but you’re laughing at him for being smarter than you. That makes you pretty stupid. I had fun drawing this cartoon since I’m from Louisiana. I took a few creative liberties, the first being that Katrina happened before Obama’s presidency and the water has since lowered. The other liberty is the ability to see the Superdome from Bourbon Street. Yeah, it’s less than two miles from the French Quarter but you can’t really see it from the street. I especially had fun drawing the balconies and the assorted colors of some of the houses and buildings in the Big Easy. Now I just made myself homesick. I don’t think it’s entirely fair to compare Republicans to snakes. I like snakes. In my early 20’s I worked in a couple of pet shops and even a zoo. I had pet snakes until I was hired by the Honolulu Star-Bulletin in 1997. I couldn’t take my two Boa Constrictors to Hawaii as snakes are not allowed there. Since then I never got another one. I don’t think I’ll ever have another snake as I’m not in the zone for the maintenance. I still love snakes and I’m usually fascinated by all animals. I don’t think Chubbs, my Beagle, will allow me to give attention to another animal (not that he thinks he’s an animal).